2016. Aerial View of Mill. 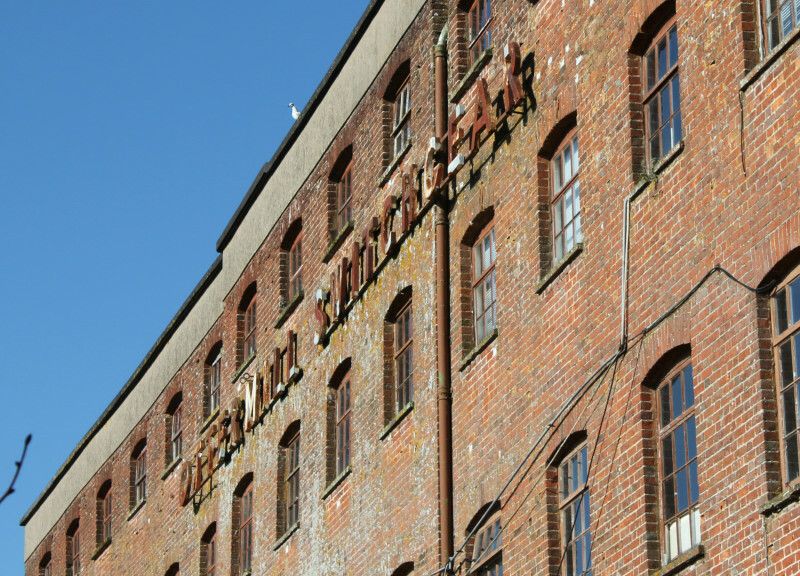 Established as a woollen mill c.1790. For a history of the mill up to 1850, see 'An 1850 Account' below. 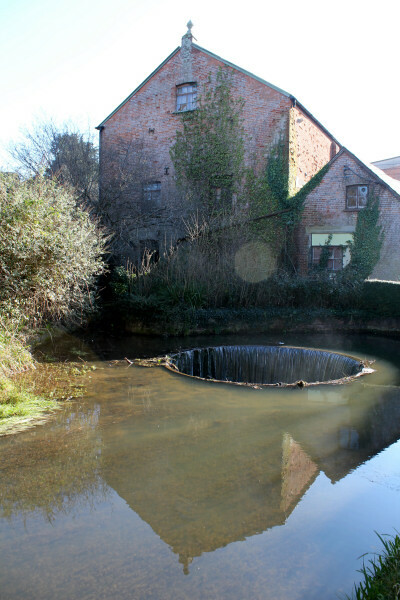 The height of the reservoir supplying from the River Otter was determined by a rare and early example of a circular cast iron weir, know as the 'tumbling weir', which can still be seen. The 18th century mill was latterly used by Eaton (Cutler-Hammer) to make electrical switchgear, having taken over Ottermill Switchgear. 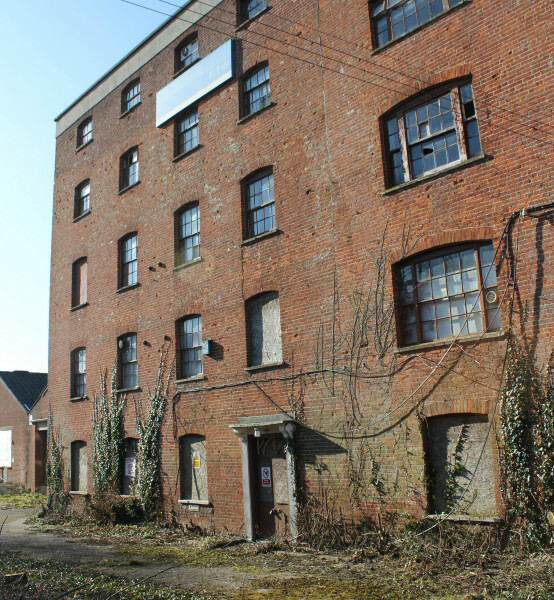 The impressive mill buildings and adjacent single-storey factory buildings have stood empty for over 10 years. 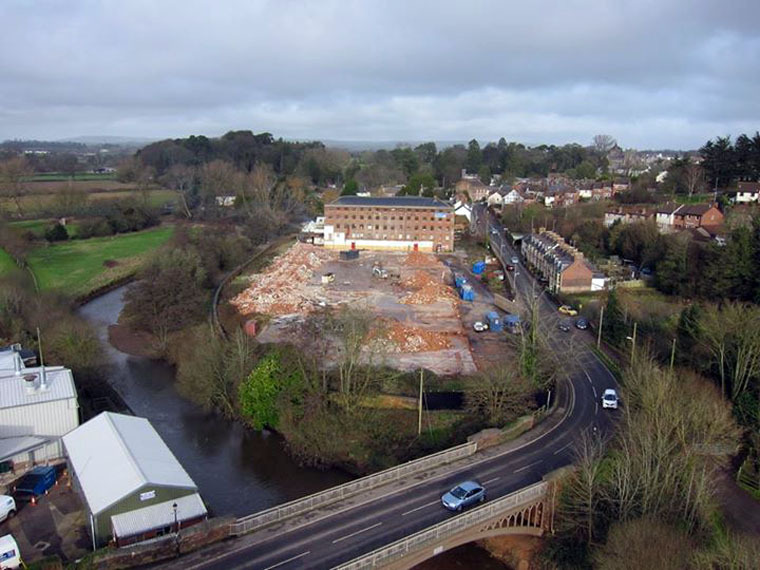 Note: The mill is adjacent to St. Saviour's Bridge (Ottery St. Mary). 'Capital WORSTED FACTORY, WATER MILL, and ESTATES, Devonshire. TO be SOLD by AUCTION, By Messrs. SKINNER, DYKE, & SKINNER, Monday the 28th November, at twelve o'clock. on the premises, at Ottery St. Mary, four lots, with immediate possession, Valuable FREEHOLD ESTATES, Advantageously situate at Ottery St. Mary, six miles from Honiton, and the sea port of Sidmouth, and only ten from the city of Exeter. Lot 1. - OTTERY WORSTED MILLS and FACTORY, erected on a commodious and judicious plan, occupying a plot of ground 140 feet in front, 65 in depth, with suitable tradesmen's workshops, a capital water wheel, 18 feet diameter, supplied by the river Otter, and works 47 spinning frames, containing 2256 spindles, roving frames, and drawing frames ; a capital fire engine, and reservoir, which with the whole of the machinery are the best of the kind, and compleated at an expence of many thousand pounds. Lot 2.- OTTERY GRIST and FLOUR MILLS, newly erected, capable of working four pair of stones, capacious Granaries, &c. with a brick Dwelling-house, and stabling. Lot 3—A Copyhold Commodious DWELLING-HOUSE, containing various apartments, convenient offices, and large garden. Lot 4.— Two Desirable FREEHOLD INCLOSURES of PASTURE LAND, containing ten acres. 'THE MANUFACTURING INDUSTRY OF DEVON. No. 6. 'Approaching it from the Exeter road, two large edifices stand prominently out, attracting the immediate attention of the spectator. One is the venerable Collegiate Church, perhaps the finest ecclesiastical edifice after the Cathedral in the county—the other, the large brick building with its windows rising tier after tier, now devoted the manufacture of narrow black silk ribbons. Leaving the old church and all its mediaeval associations, our business present is with the modern factory. This building was originally erected some sixty years since as a woollen factory, the late Sir John Duntze and Sir Geo. Young [Yonge]: the speculation we believe did not answer, and it passed into other hands. A Mr. Windeatt afterwards carried on business there for some years, and he was succeeded by a Mr. Ball, but the trade was not a successful one, the prosperous era of the woollen manufacture had gone by, and at length somewhere more than thirty years since, the factory was closed. It remained shut for some years, and small chance was there of its ever being worked again— as a woollen factory there was none, but occasionally it was rumoured that it was to be converted into a lace factory, or a cotton factory, or paper mill; but these rumours died away and the mill continued untenanted, until nearly seven and twenty years since, when all further speculation was set at rest by the mill being opened for the manufacture of silk ribbons by the present proprietor T. C. Newberry, Esq., and his late brother deceased. 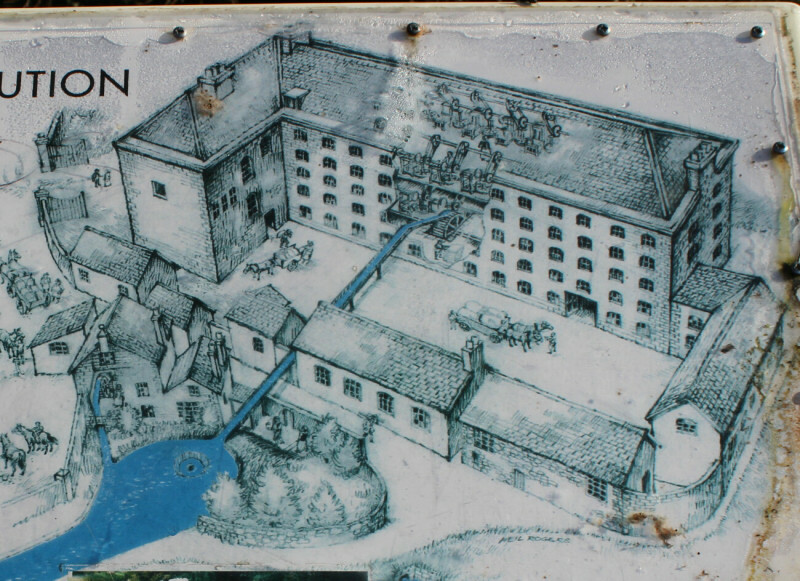 'In describing a few weeks since the Pottery at Bovey Tracey, we observed that but few people were perhaps aware of the quantity of earthenware manufactured in the immediate vicinity of this city—a similar observation applies to Mr. Newbery's mill, few persons know that a considerable portion of the silk shoe strings used throughout the kingdom are made at Ottery. Such, however, is the case ; this large mill is devoted entirely the manufacture of plain black narrow silk ribbon from a quarter of an inch to about two inches width, and in this work about four hundred hands are employed. The great emporiums of the ribbon manufacture are Coventry and Macclesfield, but we believe that in neither of these places are plain black narrow ribbons now manufactured, although it is carried on at Manchester. In this article Devonshire is however enabled successfully to compete with the manufacturing districts, although the manufacture of the beautiful figured ribbons for which Macclesfield and other places are so famous, competition is here, perhaps, out of the question. 'The Ottery silk factory is a plain brick built structure of an oblong shape, five stories in height; the dwelling house is situate at one end, the windows being uniform with those of the factory - there are eighty windows in each front or one hundred and sixty in the whole. The entrance gate is at the end nearest the town, and on entering the court there are long range low buildings on the right hand, consisting of the counting house, packing and ware rooms, and on the left the principal building or mill. On the ground floor, about the centre of the building, is a large overshot water wheel, of about thirty-horse power, which gives motion to the machinery in every room of the factory. 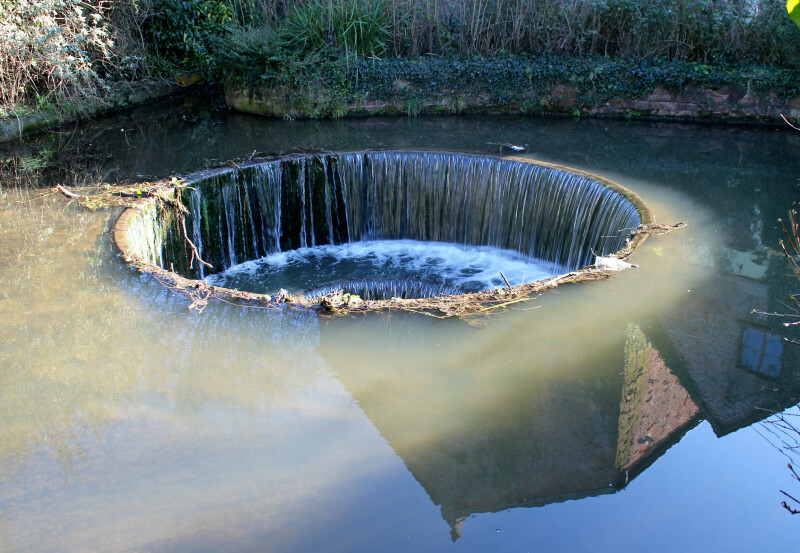 The wheel supplied with a never failing stream water from the Otter, a branch of which is conducted to the mill head a sort of aqueduct or trough, which is carried across the court, about five or six feet above the surface. The remainder of the ground floor is occupied by millwrights' & smiths' shops where the machinery used above stairs is manufactured. 'To understand the process, we proceed upstairs, until we get to the highest story in the mill, when we enter a long room full of machinery, and where some forty or fifty boys and girls are variously employed. The silk used the manufacture is of different degrees of fineness, and is the produce of divers countries—silk from Italy, the East Indies (Bengal), China, and Turkey being used. There is, of course, considerable difference in the price, amounting in some instances to as much seven shillings in the pound. Raw silk, from the great demand for it at present, is dearer than usual, and some little difficulty has been experienced in procuring it from the London Importer, the silk selling as fast as it can be imported, a proof that this branch of our textile manufactures participates in the general prosperity of the manufacturing interest. We may also mention, incidentally, that whilst there was a heavy protective duty on British silk manufactures, a great portion of the silk was imported partly manufactured—thrown—but now that the trade is free, all, or nearly all the foreign silk is imported its raw state, and is thrown in this country. The foreigners are unable to compete with our beautiful machinery used in throwing, and we now even export thrown silk. 'The first process which the raw silk undergoes is that of being wound on reels; it comes home in the shape of skeins or hanks—these hanks are placed on a six-sided frame, or wheel, called a swift, although it is not very swift in its revolutions; one end of the thread is fastened to the reel which is set motion, and the silk thread is drawn off the swift, and wound on it. When full, it is taken off, and another reel substituted. From twenty to thirty of these reels are contained in a frame, which is superintended by a boy or girl, and an ingenious arrangement is adopted to insure the uniform winding of the silk on the reel; the thread is passed through small eye attached to a horizontal frame, which slowly moves backwards and forwards, and thus the thread is wound with exact regularity. It is next cleaned, which is done by passing it through a very small glass aperture —which arrests any loose filaments. After this it is doubled, that is two or more threads are wound together, so as to increase its strength, and make it thick enough for the subsequent weaving, or for the other purposes for which silk thread may be required. These preliminary processes are subsidiary in importance to the next, that of throwing, the object of which is to twist and harden the thread, and give it greater firmness—the fibres, or small threads of the doubled silk lie parallel to each other before throwing, but after that it will be seen that they are twisted somewhat like strands in a rope. The machinery, by which this is accomplished, is well worth a visit —the most modern improvements have been adopted, the complex machine performs its work with unfailing accuracy. Row after row of large iron frames are seen, in each of which are a number of reels or bobbins, some in a horizontal, others in a vertical position, each vertical bobbin is connected with a horizontal one, the thread being wound from the one to the other; there is a spindle on each vertical bobbin through which the thread is passed, and these bobbins rotate with much greater velocity than the others. On the different rates of the velocities of the two bobbins the degree of twist given to the thread depends, and some idea may be formed of the velocity these spindles when we state that we saw hundreds of them revolving at the rate of four thousand revolutions per minute. To describe the machinery without the aid of diagrams would be impossible; we must, therefore, content ourselves with saying that the silk throwing, and the previous processes employ a great many hands, most of them juvenile, and that the process varies according to the size or strength of the thread to be produced, and whether it is intended for the warp or the shoot, in the subsequent process of weaving. 'We may mention as an instance of the energies of the manufacturers, that in a portion of one of the rooms, the only part of the factory in which we saw any machinery not at work, were some machines which had been employed in silk throwing, but some improvements having been made, they had been promptly adopted, and the old frames efficient enough, a few years ago, were at once dispensed with. There was also another machine, which had been constructed for a temporary purpose. A large quantity of silk had been purchased — there was some peculiarity about it, which prevented it from being wound off on the swifts. Well, what was to done? the silk had been bought, it was too valuable to be thrown away—so the inventive faculties of the proprietor and his foremen were set to work, and a machine was constructed, which answered the purpose perfectly ; the silk was wound, and the machine remains, should its services be again called into requisition. 'The thread, however, having been thrown or spun, the next process that of dying. This is not done at the mill, but the silk thread is packed in bales, and sent to London, and haying been dyed, it is again sent back to the factory. It would seem to be a more economical process to dye the silk at the mill, but it has been found, for several reasons, more advisable to incur the expense of sending it to London and back, than to carry on this branch of the manufacture at the establishment. 'The thread having been returned dyed black, for, as we have said, no coloured goods are made this establishment, is next prepared for weaving—the most important part of this process, being the preparation of the warp threads ; these are arranged so as to be all exactly parallel to each other, and to form altogether a width exactly equal to that of the piece of ribbon to be wove. On the regularity of the warp, the even texture of the ribbon depends. The work is done by females, with the assistance of machinery. Another portion of the work done by hand, is the winding of the weft thread on the small bobbins, which are intended for the shuttle of the weaving loom ; this is also done by females. The bobbin is placed on a sort of spindle, which is made to revolve by the turning of a wheel, very similar to the wheel of the antiquated spinning turn, still to be seen occasionally in cottages. The end of silk is fastened to the bobbin—the young woman with one hand turns the wheel, and with the other guides the silk thread, so that it is wound regularly on the bobbin. Machinery has been invented do this work, but it is found generally that the bobbins are better wound by hand, and machinery for this purpose has never been used at the Ottery mill. 'The warp and weft having been both prepared, the next process is the weaving of the ribbon, which is effected by power looms, that is, looms in which the shuttle instead of being thrown by hand, is made to fly backwards and forwards by machinery. Whole stories of the factory are filled with these looms, which are arranged in two rows, vacant space being left in the middle of the room. All the weaving is done by females, one to each loom; and in the same room are seated a number of young women, each beside of their wheel, employed in winding the silk thread for the shuttle. In principle, the loom is similar to the one used in the woollen manufacture, but as the silk ribbons are very narrow, it would be costly affair to weave only one at a time. The loom is so arranged, therefore, that from twelve to twenty pieces of ribbon are being woven at the same time. The shuttles are fixed in a long frame, the width of the loom and a sort of vibratory motion is given to this frame, which causes each of the little shuttles, or bobbins, to traverse backwards and forwards the width of the warp. Every loom is now busily employed, and pieces of ribbon are produced at the rate of more than one a minute. The ribbon, when wove, goes through no other process than that of being wound off — the narrower on cards, and the wider sold rolled up, as seen in shops. It is then packed and transmitted to the railway station at Exeter, to be conveyed to the warehouses of the wholesale dealers in London, from whence it finds its way not only into the provinces, but also to America. 'From the enquiries we have made, we believe that the factory, by the constant employment which it affords, tends to keep down pauperism, and is therefore beneficial to the agriculturists of the parish, as well as to other classes, and although the poor-rates of Otterv have nearly doubled since the new poor-law came into operation, that increase is not to be ascribed to the factory. Some eight or nine years since, a new valuation was made of the parish, and most of he household property was rated at a great increase in value, some of the small cottages, it is said, were more than doubled - the factory was also rated in about double the amount it had been previously - but the former rate undoubtedly, might have been under the actual value, because the parishioners had always considered that the mill relieved the rate, affording employment to many people, who must otherwise have been entirely maintained out of that fund. At the present time there are 55 householders, or cottagers contributing to the poor-rate of Ottery working in the mill. There are three widows with families working in the mill, who receive some relief for their children, and two married women, whose husbands are farm labourers, but receiving relief on account of illness; besides which there are married women, wives of farm labourers, and mothers of children. Some of these poor women are actually entirely supporting their families by their earnings at the mill, their husbands being out of work. But one permanent incumbrance has been brought on the parish ever since the factory was commenced, from persons working at it, and that solitary instance arose through the folly and viciousness of a family, who, at one time, were taking £100 per year from the factory. In fact many more statistics are at hand, if needed, to prove what one would have thought would never have been doubted, that an active and flourishing manufactory is a benefit to the producers of agricultural produce, in the district in which it is situated. Like all other textile manufactories, (except lace factories) the silk mills are under the provisions of the Factory Act and subject to the supervision of inspectors. The manufacturers, we believe, are pretty general in their condemnation of some of the clauses of that act, especially those relative to inspectors; they say they should have no objection whatever to a law which would subject masters to penalties for overworking children, and that convictions could be obtained before magistrates, who could enforce the penalties as do now; but they complain of the visits of the inspector, who has right to go over all the premises, and demand an inspection of the books, which they say is an inquisitorial proceeding, and worse than that subjecting mill-owners to the odium of being held up as the only class in the community who require the constant interference of the executive, in their treatment of the work people. Into that question we will not, however, go farther at present—but there is another point on which we think some misapprehension exists, that is, the recent decision of the judges as to the construction of the factory act. It has been broadly stated by Protectionists, especially by a local oracle, that the effect of this decision will be to stultify the factory act altogether, and to subject the poor children, who, course, are represented as miserable objects enough already, to the most cruel and odious tyranny from their employers, and to confinement the foetid atmosphere of a factory for some sixteen or eighteen hours a day. We believe that the decision of the judges will have no such effect. The law says that no young person under a certain age shall work more than ten hours per day ; when trade was busy, masters who found it necessary keep the mill at work more than ten hours per day, and to keep it at work, children as well as adults are required, introduced the relay system — so many children worked their ten hours, and then they were sent home, and others took their places, and by this means, if fresh relays were hand, the mill could be worked day and night, if required. One of the factory inspectors deemed this an evasion of the act; he contended that all the children who worked during the day, must be held to have commenced as soon the labor of the mill began—if, for instance, the mill began at five o'clock, and the first relay worked on (meal times of course being allowed) until three o'clock, and then another relay of youngsters took their places—although it might be proved, in fact, that they did not arrive at the mill until two o'clock in the afternoon, yet in lasr, they must be held to have began working at five in the morning, and that they were employed that day after ten hours from that hour, the master must be convicted. Some of the magistrates refused to take this view of the matter, and dismissed informations which he had laid, and on appeal against their decision, the judges decided that the inspector was wrong in his construction of the act. This page was last edited on 10 February 2019, at 12:21.